a group of vat dyes based on benzanthrone. 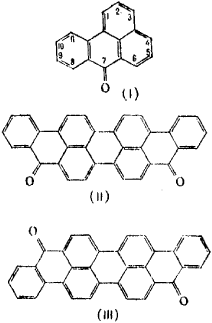 The benzanthrone molecule (I) consists of four condensed six-member rings. Benzanthrone itself does not have dye properties. Benzanthrone dyes are obtained by the condensation of two molecules of benzanthrone, with the splitting-off of four hydrogen atoms and the formation of two carbon-to-carbon bonds. Depending on the condensation conditions, either di-benzanthrone (II) or isodibenzanthrone (III) is obtained. Both substances, together with their various derivatives, the vat dyes, are distinguished by their great fastness, variety, and intensity of color tone; some of them are also used as fast pigments. Dibenzanthrone, Vat Blue 20, is obtained by fusing benzanthrone with KOH or a mixture of KOH and NaOH at 225° C. The alkaline solution of the product of its reduction by hydrosulfite is a reddish-violet color. It dyes cotton a dark blue color that is highly fast against the action of light and chlorine. Dimethoxydibenzanthrone, Vat Green 1, is obtained by the oxidation of dibenzanthrone to 16,17-dioxy dibenzanthrone and the methylation of the oxy groups. [Color descriptions are from the Colour Index, vol. 3, 1957.] It dyes cotton a very vivid dark blue-green color. Dibromodimethoxydibenzanthrone, Vat Green 2, is obtained by bromination of dimethoxydibenzanthrone; it yields colors of a yellowish hue. Isodibenzanthrone is reddish-violet and is obtained by treating 3-chlorobenzanthrone or 3,3’-benzanthronyl sulfide in a medium of alcohols and KOH. The most important derivatives of isodibenzanthrone are the halogen derivatives, such as dichlorisodibenz-anthrone, Vat Violet 1. It dyes cotton a violet color. AH benzanthrone dyes are insoluble in water and are applied to fabric in the form of leuco compounds.